Oil residue in seafloor sediments that comes from natural petroleum seeps off Santa Barbara, Calif., is equivalent to between 8 to 80 Exxon Valdez oil spills, according to a new study by researchers at Woods Hole Oceanographic Institution (WHOI) and the University of California, Santa Barbara (UCSB). 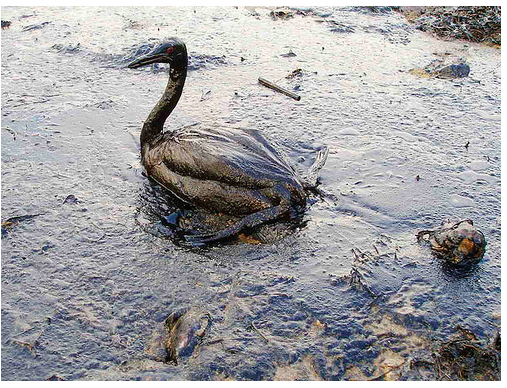 Oil content of sediments is highest closest to the seeps and tails off with distance, creating an oil fallout shadow. The amount of oil in the sediments down current from the seeps is the equivalent of approximately 8 to 80 Exxon Valdez oil spills, the study said. Earlier research by Reddy and Valentine at the site found microbes were capable of degrading a significant portion of the oil molecules as they traveled from the reservoir to the ocean bottom, and that once the oil floated to sea surface, about 10% of the molecules evaporated within minutes. Yep. I was born and raised in Santa Barbara and, as a surfer and ocean enthusiast, have lived with the oil and tar in the water all my life. Boating passed Coal Oil Point mentioned above you can see huge plumes of natural gas bubbling up. It looks like an exhaust pipe is under water the way the water boils. One summer, after driving through these waters to go spear fishing nearby, my friend jumped out of the boat and spent an half hour scrubbing the oil off the exterior of the boat. There was a thick black band of oil all the way around the boat hull. We clean it off so that when we come back into the harbor with our fish, I shot a 50 pound white sea bass that day, nobody can see the oil on our boat, which would give away where we were fishing. It should also be noted that a population of sea otters have recently, last several years, tried to reestablish itself off Coal Oil Point, where there are very dense kelp beds. The otters were eradicated some time ago to protect the sea urchin and abalone fishery. Point being, that in an area with massive amounts of oil seeping into the water daily, the otters still chose to live here rather than any other place on the coast. And on top of that, commercial fisherman place their lobster traps off Coal Oil Point every October when the season begins. Oil can kill, yes, but it is not as toxic as the agro-environmentalists would have you think. Funnily enough, there was a study done that showed that increased pumping at Platform Holly, which is just offshore from Coal Oil Point, actually reduced the amount of natural seepage. In others words, more drilling actually lessened the amount of oil in the water. Well shizaam, Andy. ‘magine that. A healthy coastal ecosystem that attracts sea life right smack dab in the middle of an oil spill equivalent to 8 to 80 Exxon Valdez spills. Thank you for the informative comment, friend. It sounds as if the hull of your friend’s boat got pretty scummy. Surfing, boating, spearfishing, shooting a 50 pound sea bass — is there anything you don’t do? The horror. Now we have to determine the environmental impacts of bateria feeding. This clean up of the trajedy could doom the planet and should be stopped immediately. Uuughhhh, when will you people learn! You say that in jest, but I actually am curious to see what effect a jillion, obese, All-American microbes might have on the ocean. Obama’s drilling moratorium has halted operations in my local waters forcing people to lose their jobs and have to file for unemployment. “It’s not only people employed by the company, but subcontractors, cooks, people that clean up the galleys, launderers, engineering and drilling, and technical folks are at risk,” said Romero. Alright, I feel like a spammer here, but, the latest issue of Montecito Magazine (Montecito buts up against Santa Barbara, you know, where Al Gore recently bought a house. )has a cover story on the Santa Barbara Channel titled, “Galapagos of the North.” It is written by the editor of a surfing magazine I write for. So, my point: Here we have one of the world’s most biologically rich areas of ocean existing amid the world’s second largest natural oil seep. You never need to feel like a spammer, ScummyD. I like your comments and your links. Thank you for dropping by.